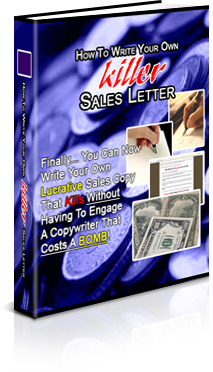 How YOU Can Write Your Own Sales Letter That Kills - Which Produces a Minimum 2-4% Conversion Rate - And Save $10,000 From Hiring Your Own Copywriter! Did you know? Just recently, I heard that a friend of mine has engaged a professional copywriter to write a perfect sales letter for his product. He paid the copywriter $10,000 for the sales copy written - and now he is enjoying a great 10-15% conversion rate produced by the sales letter written for him. In other words, every 10 to 15 prospects who read his sales letter would buy his product - with dead certainty. It did not take long until my friend covered his investment and later profited from his business, thanks to the copywriter he engaged. That is a perfect $10,000 well invested. Now, you wish you have had $10,000, don't you? It is as if there is a huge gap between those who have money and those who don't have money, and this gap decides who will go on to become the next best-seller and the rest will stay just that - broke. You don't have $10,000. If you have $10,000 to spare, there is no need for you to read this letter - just search for the same copywriter my friend has hired and you will enjoy the same, marvelous results. You have a product or service to sell. You have already researched the market and discover that there is a demand for the kind of product or service you want to sell. You have prepared your product or service and now what matters is, "How can I sell my product or service?" You wish you can write your own sales letter! You don't have $10,000, granted, but even if you have $1,000 to spare, you may not be getting the kind of results you desire and it can be "money down the drain", as they say. Perhaps, the next best option is that you write your own sales copy. However, you don't know how to write your own sales copy. Heck, you don't even have a clue! No, You don't even need to invest anywhere near $1,000, either! To learn why this is the case, read on! Why Have Your Own Powerful Sales Copy? Let's face it: if you want to be in business, you must learn how to sell. Selling is the number one skill you MUST learn if you are going to be in business, and this applies online, too. If you don't know how to sell, it is a small wonder why you and your business are struggling right now. Forget the numerous "no selling required" ads you have come across online because that is pure B.S. statement. The reason is simple: the truth is that if you do not know how to sell or HATE selling, you cannot make money. Period. An income opportunity to provide to people online. But the fact is this: if you do not know how to sell, you cannot turn your idea or product into a money-producing asset, no matter how great or high in quality they actually are.